The release of Necrosphere Deluxe for PS Vita was quite a surprise announcement from Sony’s publishing label Unties as this is their first ever published game for Sony’s handheld console. Besides the PS Vita version, Necrosphere Deluxe is also available on Nintendo Switch. For this review, I take a look at both versions of the game. Necrosphere Deluxe tells the story of agent Terry Cooper who finds himself in the Necrosphere after he was shot to death during an ambush. The Necrosphere is where you go when you die but there’s nothing much to do there besides waiting for eternity. With the help of his fellow agents Tara and Markus, Terry finds out that there are portals that can bring him back to the Normalsphere, the world of the living. As Tara and Markus can not enter the Necrosphere, they have placed several objects and items that help Terry to escape from the Necrosphere. The story is told with little notes that are scattered through the Necrosphere and give you a little bit background info on the world of the death. Although the story is nothing groundbreaking, I found it quite funny. 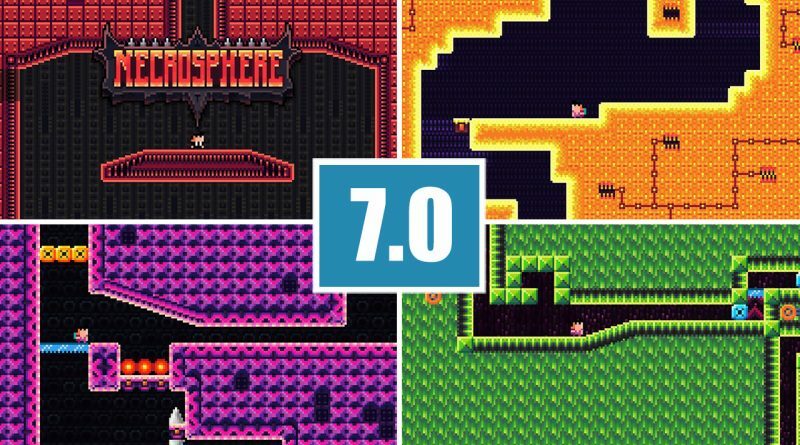 Necrosphere Deluxe is a Metroidvania platformer that you control with only two buttons. Terry can be moved left and right with left / circle button on PS Vita and left / A button on Switch. You can also use left and right shoulder buttons but I found this control method less comfortable. Unfortunately, there’s no option to remap the control scheme as I would have preferred to use square / circle buttons on PS Vita and Y and A buttons on Switch. Actually, the controls work quite well in the first areas of the game. With a little bit of practice, I could move Terry quite safely in the Necrosphere. 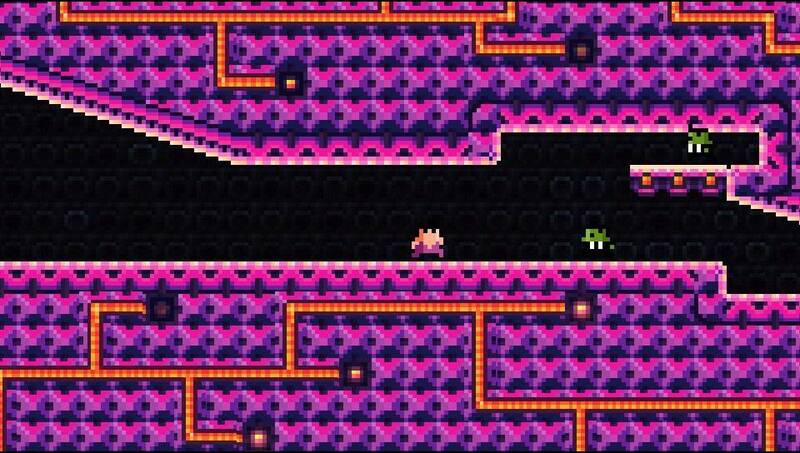 Some areas contain puzzles on how to proceed or need some training but everything until the 2nd half of the magenta area is pretty managable. 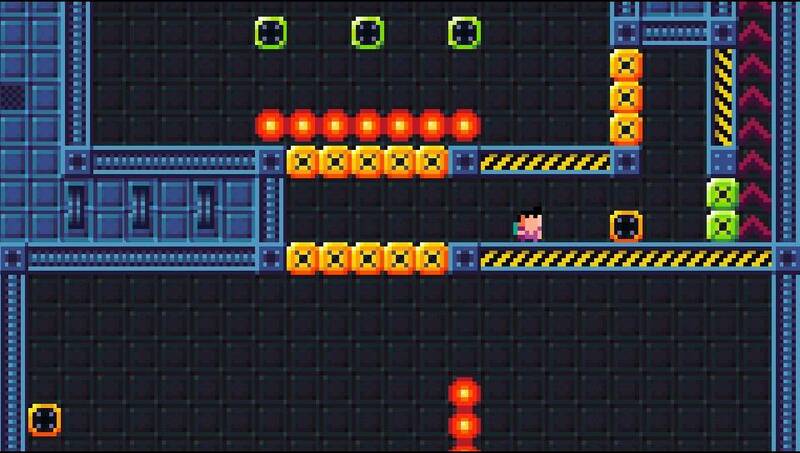 As you progress through the game, Terry finds new items that enhances his abilities such as dashing, breaking bricks and a jet pack to reach new areas and portals. Once you reach a portal, you start from the beginning and you can use the new ability to explore further the Necrosphere. As already mentioned, the game is pretty managable until the 2nd half of the magenta area which is around 60% completion. 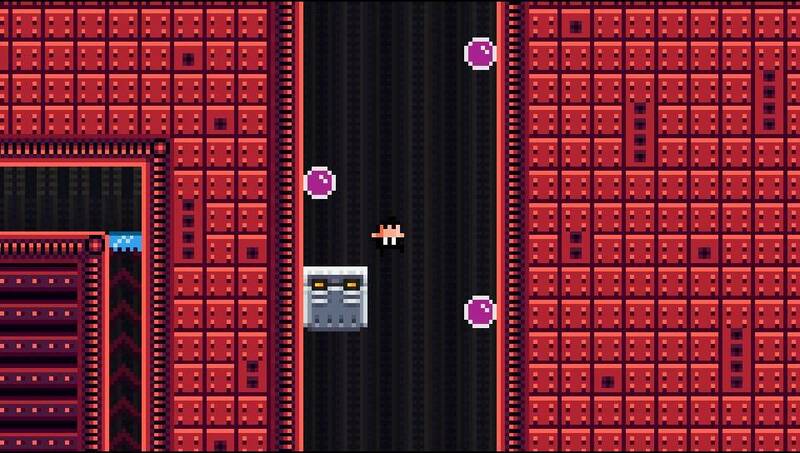 From there, the difficulty ramps up pretty much and the two-button control scheme becomes more and more annoying as perfect jumping and dashing is needed. Checkpoints are also less frequent which makes it more frustrating than it should be. There were parts of the game where I thought I will never make it but with lots of trying I always could make it in the end. In my opinion, the difficulty in the later areas is not balanced well and could have been done better. Besides some frustration in the later parts of the game, I still enjoyed playing Necrosphere Deluxe, thanks to the good level design that kept me motivated until the end. The game also includes a bonus story which can be unlocked when Terry collects 5 DVSs. I needed around 4 hours to complete the game but with lots of practice, this can be done in even less than half an hour. Necrosphere Deluxe is presented in nice retro-style graphics with some neat background effects. 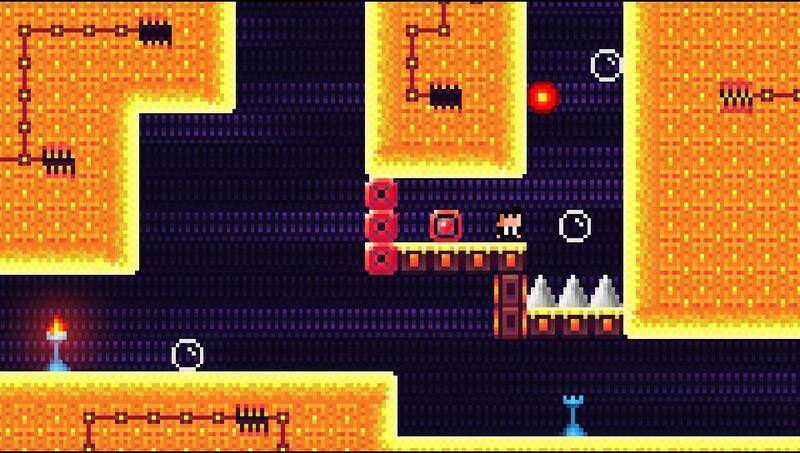 Each of the 5 areas is designed with a different color scheme and the game runs with 60 fps on both PS Vita and Nintendo Switch which is actually needed for the perfect platform action. The soundtrack of the game is pretty good and fitting and each area comes with a different background music. Necrosphere Deluxe is a challenging two-button platformer with some good level design. Although it gets pretty hard in the later part of the game, it still can be enjoyed from those who look for a short and challenging experience. All screenshots are taken from the PS Vita version. The review is based on a review copy which was provided by the publisher.